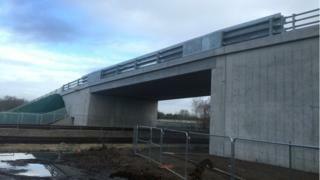 A £6.7m traffic-easing bridge has opened at Newbury Racecourse in time for the Hennessy Gold Cup this weekend. The event on Saturday is part of a three-day racing festival expected to attract more than 30,000 people. The bridge was designed as a major route into the racecourse, reducing traffic loads into the car parks. It will close after the race meeting as construction work continues on a £42m development, building 1,500 homes around the course. Network Rail has carried out safety checks on the bridge, built by David Wilson Homes, which takes traffic and pedestrians over the railway. There was speculation whether remedial works would be completed and signed off in time for the event at the racecourse, which has been criticised in the past for "regular traffic chaos". Racecourse chief executive Julian Thick said: "The bridge is absolutely finished but we have a major redevelopment going on here, so the bridge will open for racing. "The next stage of our development [in the area by the bridge] kicks off straight after the race meeting so we will close it again and just use it for racing until that area is completely finished." Up to 18,000 people are expected on Saturday for the famous Gold Cup race. With its £200,000 prize money, it is believed to be the richest race in the jumping calendar until the Cheltenham Festival in March.